I hope you’re doing well and having a great week! As I mentioned in last week’s newsletter blog post (and you may have seen from some if my social media posts), I recently gave another Tedx talk. This new one is called Bring your Whole Self to Work. The talk is just 12 minutes long and focuses on the importance of bringing all of who we are to the work that we do, as well as doing what we can to create an environment around us where people can do the same. These are things I’ve been researching, writing, and speaking about for years – and I feel like this new TEDx talk encapsulates some of my newest thinking and most exciting insights. I hope you enjoy this talk and it gives you some inspiration and ideas about how you can more fully bring all of who you are to work that you do (and encourage others to do so as well). I recently gave a TEDx talk in which I reflected on what I’ve seen and learned over the past fifteen years – researching, writing, and speaking about essential human experiences in the workplace. 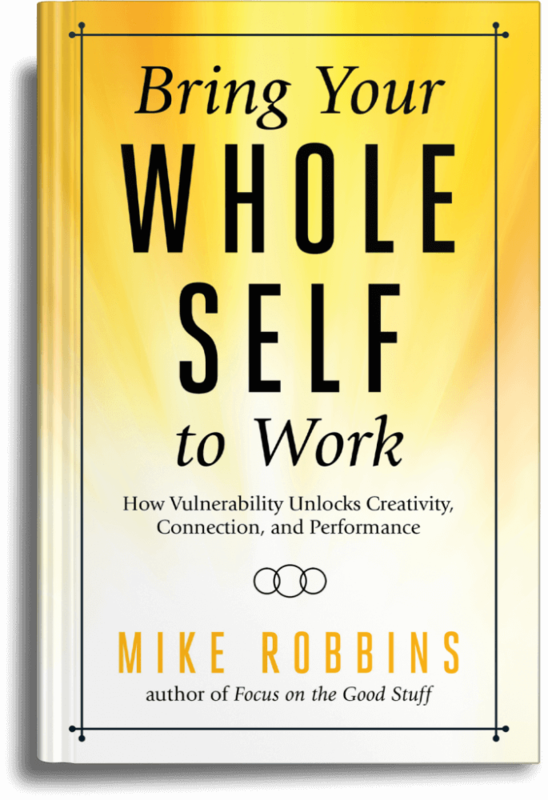 As I addressed in this talk, I believe that for us to thrive professionally, especially in today’s world, we must be willing bring our whole selves to the work that we do. And, for the groups, teams, and organizations that we’re a part of to truly succeed, it’s essential to create an environment where people feel safe to bring all of who they are to work. While this is a fairly simple concept, it’s much easier said than done. It takes a great deal of courage for us both individually and collectively to bring our whole selves to work. However, what my research and experience has shown me is that when we do this – not only are we more likely to create success and fulfillment for ourselves, we can have the greatest impact on the people around us and together we’re able to do our best work. 1) Embrace vulnerability – We erroneously think that being vulnerable is a sign of weakness; it’s not. While vulnerability can be scary and hard, it’s actually essential for healthy risk, change, growth, creativity, innovation, and more. We can’t do, experience, or accomplish anything new or significant without vulnerability. As Dr. Brene Brown from the University of Houston says, “You can’t get to courage without walking through vulnerability.” She’s right, and the more willing we are to embrace vulnerability, the more courage we have to do our work the way we want to and to have the kind of impact we most desire. 2) Be willing to have sweaty palmed conversations – A number of years ago a mentor of mine said to me, “Mike what stands between you and the kind of relationships you really want is probably a ten minute, sweaty palmed conversation that you’re too afraid to have.” Too often we avoid difficulties, challenges, and conflicts with others because we’re afraid of the consequences of speaking up or engaging. However, when we have the courage to have those “sweaty palmed” conversations, we increase our ability to resolve conflicts, make deeper connections, and build authentic confidence. 3) Stop trying to survive – Something that gets in our way, especially when we’re doing things that truly matter to us, is that we hold back and play it safe. I learned a lot about this during my years as an athlete – over 18 years of playing baseball, even and especially at the college and professional level – the most disappointing moments I had weren’t when I failed, but when I held myself back due my fear of failing. I remember a coach of mine saying something powerful and poignant to me about this. He said, “Mike, you’re living your life as though you’re trying to survive it. You have to remember…no one ever has!” When we consciously let go of our obsession with survival, we make it possible to take risks and go for what we truly want. – Healthy High Expectations: High expectations are essential for people to thrive. However, the expectations have to be healthy – meaning there is a high standard of excellence; not insatiable, unhealthy pressure to be perfect. We almost always get what we expect from others, although if we expect perfection, everyone falls short and people aren’t set up to succeed. Healthy high expectations are about having a high bar and challenging people to be their absolute best. – High Level of Nurturance: Nurturance has to do with people feeling seen, heard, and valued – not just for what they do, but for who they are. It also has to do with it being safe to make mistakes, ask for help, speak up, and disagree. Nurturing environments are filled with an authentic sense of compassion and empathy – people feel cared about and supported. We often think that in order to have a high bar we can’t also be nurturing. Or, we think if we nurture people, we can’t also expect a lot from them. Actually, the goal is to do both at the same time, and to do so passionately. Bringing our whole selves to work and creating an environment which supports this are no small things. They take courage on everyone’s part and, at times, go against conventional wisdom. However, when we’re willing to show up fully and we encourage others to do the same, that creates the conditions for all of us to thrive. How easy or difficult do you find it to bring your whole self to work? Is the environment where you work feel safe and conducive to you bringing your whole self? What questions or suggestions do you have about this? Share your thoughts, action ideas, insights, and more below.